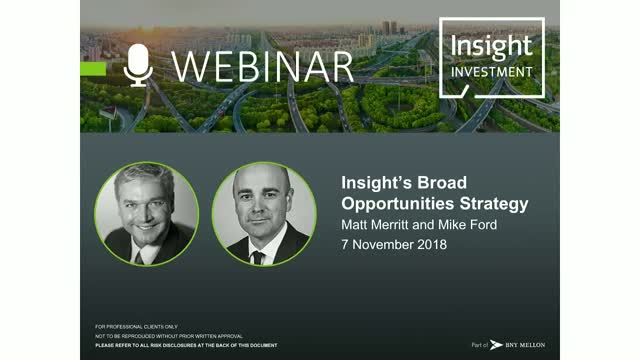 This is an opportunity to hear from Matt Merritt, Head of Multi-Asset Strategy Team, and Mike Ford, Portfolio Manager, who will update you on our views about the evolving economic and market environment and outline how these developments are shaping your diversified growth. Join Portfolio Manager, Pritesh Solanki, as he reviews global markets and provides an outlook for where we see potential for investors. Join Senior ESG Analyst, Joshua Kendall, as he presents Insight's annual responsible investment report. In this webinar we consider how investors can make the most of a responsible investment approach, explain how we work to analyse and engage on ESG risks, and discuss what we have done over the last year to further enhance our approach. Join Portfolio Manager, Oliver Williams, as he reviews recent developments within emerging market debt and offers an outlook for the asset class. Insight's Senior ESG Analyst, Joshua Kendall gives an in-depth analysis of our proprietary country sustainability model. We invite you to join our Portfolio Manager, Adam Whiteley, as he reviews recent developments within fixed income and offers his outlook for the asset class. We invite you to join Portfolio Manager, Oliver Williams and Analyst Simon Cooke, as they review recent developments within emerging market debt and offer an outlook for the asset class. In this video Jeremy King, Head of Business Development, explores how investors can practically benefit from accessing the complexity and illiquidity premia on offer in secured finance assets. Watch our short video on how Insight can assist insurers with building investment strategies for future challenges. Watch our short video on how Insight approaches fixed income for insurers. Insight continues to enhance its approach to responsible investment in fixed income, building on over a decade of experience and expertise. In this video we explain how we seek to invest responsibly by taking ESG risks into account across our fixed income strategies. We invite you to join our portfolio manager Harvey Bradley as he reviews recent developments within fixed income and offers his outlook for the asset class. We invite you to join our portfolio manager Robert Simpson as he reviews recent developments within emerging market debt and offers his outlook for the asset class. Watch our video to hear Alex Veroude,Chief Investment Officer, North America and Gareth Mee, Executive Director, EMEIA Insurance, Ernst & Young discuss what makes Secured Finance so compelling for institutional investors.